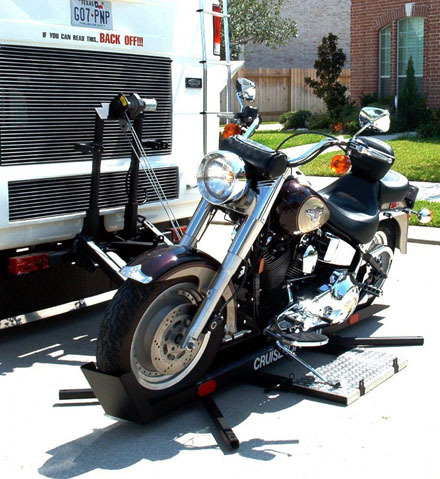 The CRUISERLIFT motorcycle lift is a simple and safe way for one person to load and transport almost any motorcycle on the back of a Motorhome or RV. This model sits on a specially designed platform that slides into 3 trailer hitches that are installed on center and 18" approximately left and right of center. The original hitch on your RV is not utilized. The additional hitches together with all necessary parts for installation are included and shipped with the lift. 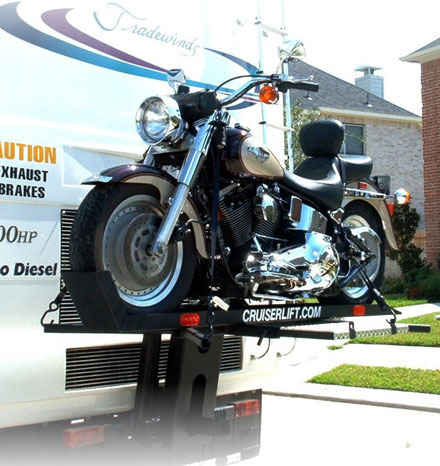 Once the CRUISERLIFT is installed, just roll your motorcycle onto the rail and tie-down the bike. Then, press the button to raise your bike in seconds. Unloading is just as easy. CRUISERLIFT is precision welded utilizing tooled fixtures. It is made from thick, high quality carbon steel. And, the black powder coated finish provides long lasting rust protection. Holds one motorcycle - works with sport bikes through full dress bikes weighing less than 1000 Lbs. CRUISERLIFT uses maintenance-free HMW nylon rollers. No lubrication is required. CRUISERLIFT comes complete with All Weather 12v 2000 pound electric winch with 2 cable/pulley turns, giving a 6000 pound winching capability. Supplied control switch can be mounted in any convenient location. Flip the switch and watch your motorcycle load - safely, easily. 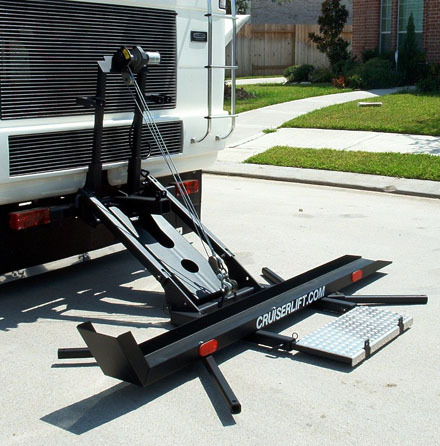 CRUISERLIFT installation allows towing of another vehicle while transporting your bike at the same time. more Features. Installed CruiserLift in down position - ready for motorcycle. NOTE: For access to engine, lift winch out of the way and open engine lid. Roll motorcycle onto lift and put the kickstand down. Then, tie off to tie-down tubes. Loaded motorcycle raised into position for transport - on the CruiserLift.